11/26/15 Radio Show. Just music again. Happy Thanksgiving to you, fine listeners. Just music again this week. Stay tuned for next weeks show where I discuss malaria, immunology, and access to medicine with an esteemed guest. 11/19/15 Radio Show. Just me, music, and talking in to the mic about the universe. Aired on WPRB 103.3 FM from 2 to 4am on Thursday, November 19, 2015. I’ve been doing a lot of interviews, but this one is just me, some music, and some chat about Enceladus (moon of Jupiter that’s getting scientists all excited) and sound waves in the early universe. Because yolo. I talk a lot about Enceladus and why it’s such a promising moon for us to study. It turns out that there’s geothermal activity! Geysers and volcanoes and stuff! This is due to tidal effects with a bigger moon nearby – Dione. Additionally, during a later mic break I discuss Baryon Acoustic Oscillations – these are sound waves in the early universe that pushed matter around and greatly affected the distribution of galaxies and galaxy clusters in our universe. Nasa image of Saturn’s moons and rings. Cassini mission. Enceladus and Dione – NASA image, Cassini mission. Quinn Gibson is a doctoral candidate in chemistry here at Princeton University where he works in a solid state chemistry group, the CavaLab. From what I gather, they’re all about looking for materials with new and interesting properties. First they make predictions based on physics and chemistry, then they synthesize the materials — metal crystals — and characterize them. In their lab, one edict is “don’t be a baby about blowing stuff up.” So, kids. If you want to blow stuff up without living a life of crime, chemistry may be for you. Just how the invention of the transistor has revolutionized every aspect of our lives, the new materials that Quinn creates, like these weird things called topological insulators, could change everything. He explains it all right here in this show. Also check out Quinn’s music at qfolk.bandcamp.com. We play a couple tunes on the air and he tells us how they came about. P.S. Check out Jack on Fire’s new songs on their soundcloud (this show features the excellent tune, Beat the Rich)! Elizabeth Davison is a graduate student in Mechanical and Aerospace Engineering here at Princeton University where she studies the capability of using networks to measure the processes in our brain. We speak generally on what a network is, what are neural networks vs. “a network of neurons”, and her work specifically, then we broaden to applications. Next, with Tasha Quintana, doctoral candidate at the Nicholas School of Environment at Duke University, we discuss one powerful application of networks — information sharing in fisheries in Baja California. Then we go on to discuss work to broaden successful networks in Baja to larger networks, like the environment we all share. An excellent (journal) article on graph/network theory. Another beautiful representation of networks and information flow. This image is a network of information flow in the sciences through citations. Follow the link and you can click on different portions of the ring to see how certain fields have a lot of interactions, as well as looking at the data journal-by-journal. 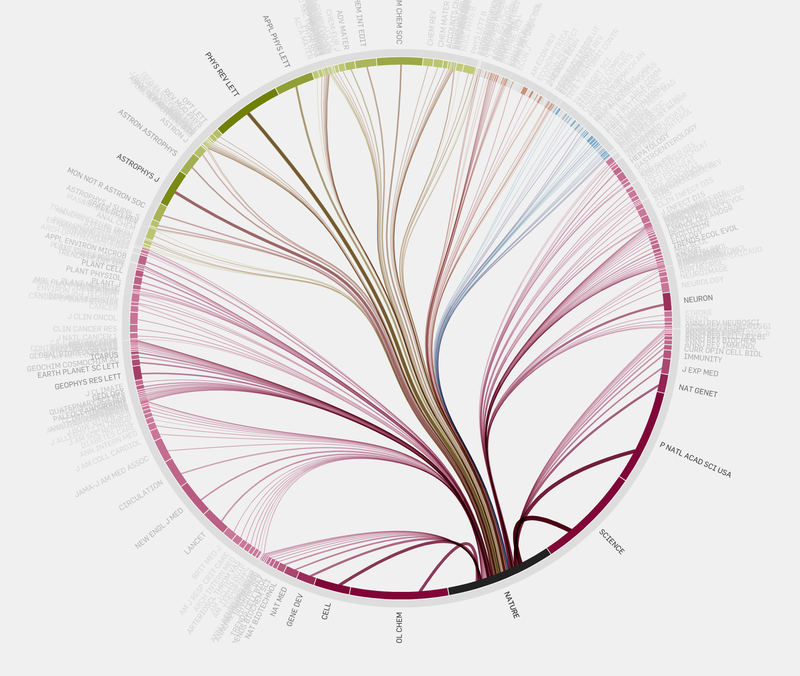 From well-formed.eigenfactor.org, this beautiful image tracks information flow in the sciences by following citations in journal articles.